5.0 out of 5 stars A must for any Metallica fanatic! THE WHOLE UNADULT-RATED STORY BEHIND THE WORLDs MOST INFLUENTIAL BAND.IF YOU WANT TO KNOW THE BIRTHPLACES, DATES, OR EVEN PREVIOUS BANDS, THIS IS THE BOOK FOR YOU. IT EXPLAINS IN DETAIL THE OFTEN MISLEADING STORY BEHIND CLIFF BURTONs DEATH. THIS BOOK COVERS EVERYTHING FROM KILL’EM ALL TO THE BLACK ALBUM AND EVERYTHING IN BETWEEN. IT TAKES ABOUT THREE OR FOUR HOURS TO REALLY FINISH THE BOOK IN-DEPTH. IF YOU HAVE EVER WANTED TO KNOW HOW THE SNAKEPIT WAS CONSTRUCTED, READ THIS BOOK. HAS COOL FOTOS OE EVERYONE…EVEN THE LATE GREAT CLIFF, AND THE ONCE AWESOME DAVE MUSTAINE. THIS BOOK RULZ! This book is a detailed story of the members of Metallica. It starts out when they were no more that a garage band & takes you through their first to their & more. Along the way telling stories of the new & old such as the real stories of the death of Cliff Burton. When I was in fifth grade I was first introduced into the world of Metallica by hearing “Enter Sandman” on my friends walkman. I wasn’t immaterially drawn to it, yet a year or two later after hearing the Master Of Puppets album (which later became my favorite album) I became more and more interested. When Reload came out in 1997 I decided that it was time to begin buying the albums. About a year later I owned all the albums, picture disks, and the 1993 box set. I decided it was then time to learn a little more about the history of Metallica. I got this book and began reading it. Immaterially I was drawn in a couldn’t stop reading. It gave a beautiful history of rock in general and gave every little detail of Metallica possible from the garage to the snake pit. Whether it be the name “The Frayed Ends” that Metallica used as there alias when playing at clubs, or the attempted music videos that failed. It gives great quotes from the band and some of the most prominent names in rock. 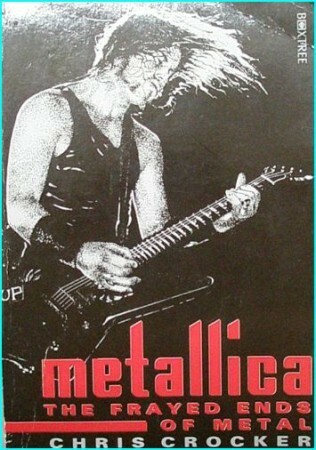 I think every Metallica fan has to read this book. If you read one thing this year, make it this book. You wont regret it. I have always been a fan of Metallica, ever since I heard “Nothing Else Matters” when I was 9. I was flipping through the tv, when I stopped at MTV. It was playing on that channel. Now I don’t know why I was attracted to this song, this type of music, but I just knew that I liked it. My first Metallica cd was “The Black Album”, released in 1991 (aka “Metallica”). Then “Load” followed, and then their best cd, “Reload”. Which why now, a heavy Metallica fan, I recently bought this book. I was curious as to how Metallica got started, and why they’re so damn good. This book answered all my questions. Its neat how they start out in a garage, now, they are the monsters of heavy metal. Details, this book has loads of details. From how James Hetfield, the lead singer playing rhythm guitar, can’t read sheet music (but still rocks), to the band only being alloted five dollars a week from their contracters, this book tells all. As Lars Ulrich (drummer) says, “Metallica is it. When that ceases, thats it.”. And hes right. i thought this was an excellent book, the only one i’ve read cover to cover and enjoyed. I have been a metallica fan for a long time and i thought i knew a lot about them but when i read this book i found a lot more that i didn’t know that was very interesting. I would highly recommend it to a metallica fan or anyone. This is an incredible book. If i had time i would read it over and over and over. I want to see everybody read this book.